Of course it’s not going to be good. It never could be, at least not with the people behind it – Michael Bay as producer, the director of Battle: Los Angeles calling the shots, it was gearing up to be DOA as soon as it was announced. Sure enough, the end result that is the 2014 edition of Teenage Mutant Ninja Turtles ends up being the uncomfortable and irritating cash cow we had all come to expect. But the real question is, just HOW bad is it? The honest answer is, it’s hard to truly label this film as being stupid beyond belief (even though it is) when the whole idea of it is just as dumb to begin with. Before it became the family-friendly franchise we know it as today with countless cartoon shows, a few feature films and endless merchandising plugs (Teenage Mutant Ninja Turtle Pies, anyone? Yes, that was really a thing…), the concept began life as a graphic novel that intended to parody the tropes of dark and edgy comic books at the time rather than stick to them like glue. Like any successful parody, it gained a fanbase for its reflective commentary on their chosen target while at the same time standing strong as its own thing. For example, more people seem to remember comedy classic Airplane! more than they do the Airport series of movies it was satirising, because its mocking of the po-faced seriousness of that series of films was so accurate that it was great cause for laughter, and the story and characters were well-written enough to be entertaining on their own even if audiences had never seen that particular film series. It’s the same with the Turtles, except theirs is a case of the impact lasting longer than the joke, to a point where it has now become an example of the very tropes it was satirising to begin with. Even still, one has to acknowledge that to call this film stupid and laughable was exactly the intention of the original creators, so it’s unfair to put all the blame onto Bay for making it this way when it was already designed to be laughed at and mocked to begin with. With the writing and plotting being as lame-brained as the next Bay impersonator, it doesn’t leave much room for its actors to work around or really do anything to contribute. Fox sadly does not have the skills it takes to bring fan favourite April O’Neil to life, and she ends up being as lifeless as a piece of cardboard in a cemetery – you have to wonder if she gave this wooden performance on purpose, given her uneasy past with Bay when she compared him to a certain German dictator on the set of Transformers 2 – and Will Arnett, usually reliable in comic relief roles, is wasted here as a sidekick cameraman who apparently has a thing for Fox (a bit of a creepy subplot, especially when you consider the 16-year age gap). William Fichtner hams it up whenever he’s on-screen as the sort-of main villain, and to his credit it seems as though he’s at least having fun with it all. Also of note: former SNL star Abby Elliott, who briefly shows up as Fox’s ditzy roommate, makes the most of her scenes despite the poor material and we reckon – with a few rewrites and better direction – she could have made for a much more lively and entertaining April O’Neil than Fox. 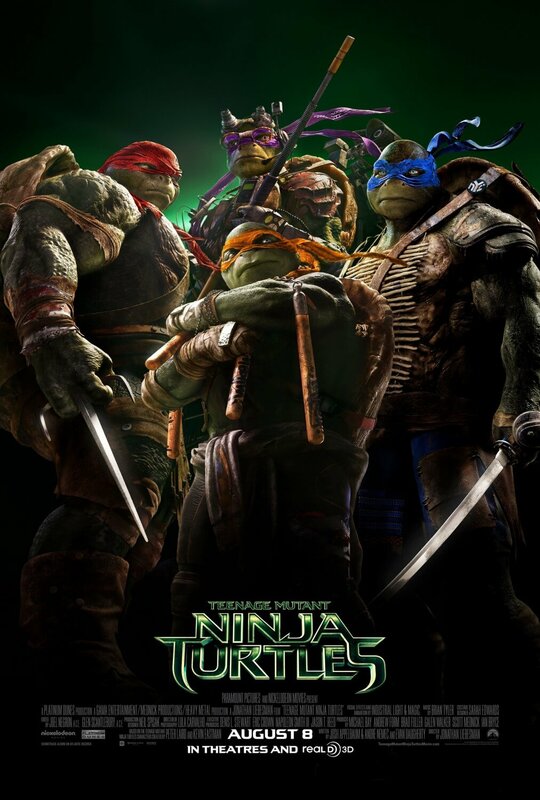 As for the Turtles themselves, some purists may balk at their less-than-appealing designs but will at the very least admire that they have mostly kept true to their original characters even with the typical insertion of Bay into the mix – when Michelangelo, the out-spoken jokester of the group, cracks a joke it’s still in keeping with the character, as is when Donatello speaks vividly about technology and science-y stuff. The CGI used to create them for the big screen can be off-putting, ruining the illusion that they’re really there when in actuality they’re not, and they are never shown to really connect as brothers which leads us to not really care about what happens to them (bar one scene in an elevator which, though again rather silly, shows the Turtles truly acting as one for the first and only time in the film).